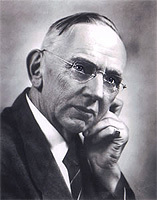 Who was Edgar Cayce? In my opinion, among many things, he was a very good remote viewer and of course, an evolved soul. Though his technique was not officially called remote viewing, he used the process that I speak of on my Extended Remote Viewing page. Extended remote viewing is where the viewer puts the body to sleep, yet maintains consciousness. Similar to an extended remote viewer, Edgar Cayce was known for being able to break the time/space barrier by putting his body into a self-induced sleep state, or trance. He would lie down, induce trance (or sleep) and see things well beyond his physical eyes. Similar to remote viewing, his answers to questions had no limits. Ịn fact, it's documented that he touched on thousands of subjects while in trance. He would give insight into the meaning of life, health revelations, astrology, business issues, and the future, and many other things. He tapped into the Universal Consciousness in ways few others ever have or will. In that regard, he can be considered a pioneer. Well before Ingo Swann coined the term "Remote Viewing", Edgar Cayce was leading the way even before the "New Age" era had begun, just under a different guise. Much of what Edgar Cayce wrote about pertained to health issues, which to this day, still has an impact on many thousands of people. Individuals continually find insight into their health issues through words written over 65 years ago by this medium. Health centers and followers of his teachings have spread from this country to numerous others. Edgar Cayce brought to the surface, in the Western world, such terms as "soul-mate", "Akashic record", "meditation", and "holism". He broadened the minds of millions of people during his lifetime and well beyond. He is indeed a spiritual pioneer. Though he taught the same fundamental teachings of Christ and was a devout member of the Disciples of Christ, he was still rejected by Christians for his views on reincarnation and the Akashic record. I think a degree of Cayce's work stemmed from the fact that he was a natural healer. This is why healing became his central theme in his readings in later years. When he was a young man he developed a throat condition that threatened to take his voice all together. Though the doctors were at a loss, Edgar used a previously developed technique of trance to enter another subtle realm and find solutions to his own illness, which he later cured. He had used this technique earlier in his class studies. He would sleep on his schoolbooks and "attain" information contained within. Edgar realized this ability was not limited to schooling and his own health, but could help others. I must say that I admire Edgar Cayce in many ways. He broached subjects that were surely not talked about - at least publicly-- in the U.S. during his time here. He also didn't put himself on a pedestal. He said, and I agree, that what he could do, we can all do (Christ said the same thing.) He may have had a natural tendency, but with application, we can all learn remote viewing and healing. He said that we could talk to loved ones, passed on or not. We could tap into our dreams and the universe, that symbology was individual, not a generic meaning that some Freudian teachings postulated. He talked of the oneness of life, which I wholeheartedly agree with, and that this is the very planet and plane for which we come to learn and that we do! His thinking was so amazingly forward for its time that it's rather astounding. As for his predictions, he predicted major events such as the ending of World Wars I and II, the lifting of the Depression, racial strife in the U.S., and assassinations. What I find particularly interesting is his mention of the possibility of a third World War with Middle Eastern countries of which we are now in conflict with... Only time will tell if this is yet another one of his insightful visions into our future. I shall close now and as Edgar Cayce would say at the end of a reading, "We are through".